Are you dreaming of white sand between your toes and crystal blue Caribbean waters? Golfing on luxurious green golf courses? Dining, drinking, and dancing to island beats that echo through the midnight blue of the Caribbean night? If you are considering, or even thinking of a trip to the Caribbean, and want more than a run-of-the-mill vacation or cruise, you need to consider a Caribbean sailing vacation from Sailing Ship Adventures. So much more than the average Caribbean vacation or cruise, a Caribbean sailing vacation from Sailing Ship Adventures is an adventure for the mind, body, and soul that is as memorable as it is unique. Why settle for the usual Caribbean vacation or cruise when you can embark on a unique Caribbean sailing adventure, skimming from island to island under billowing sails across crystal blue seas, retracing the routes of explorers and pirates and exploring the hidden gems of the Caribbean? A Caribbean sailing cruise from Sailing Ship Adventures offers so much more than the typical Caribbean vacation or cruise, including deep sea fishing, whale watching, scuba diving, wind surfing, swimming with the dolphins, and more. For more information on a Caribbean sailing cruise from Sailing Ship Adventures, or to start planning your own unique Caribbean sailing adventure, call us at 1-877-882-4395 or contact us online. The adventure doesn't stop once the tall ship pulls into port. Every Caribbean sailing vacation from Sailing Ship Adventures offers a wide variety of activities to suit almost any taste. Spend your day shopping at island boutiques, lounging on beautiful Caribbean white and black sand beaches, or golfing on some of the finest, most challenging courses on the islands. These are just a few of the activities that await you on a Caribbean sailing cruise from Sailing Ship Adventures. Other activities include dining, dancing, plantation tours, hiking and nature tours, and more. A Caribbean sailing cruise from Sailing Ship Adventures brings all the islands of the Caribbean to you. We offer a wide variety of Caribbean sailing vacations and Caribbean sailing cruises with a wide range of itineraries to help you plan the perfect Caribbean sailing vacation, from the Bahamas to the Grenadines, and everywhere in between. For more information, review our list of Caribbean sailing vacations, or contact our customer service department. 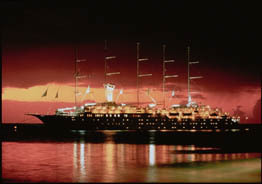 We would help you find the perfect Caribbean sailing cruise for you, or answer any questions you may have. Simply call us at 1-877-882-4395 or fill out this online contact form, and soon you could be enjoying the thrill of your own Caribbean sailing vacation.